Frederick, MD –On Saturday December, 8, 2012, the Museums by Candlelight event offers free holiday-themed programs at over 20 museums and historic sites in Frederick County, Maryland. The event features the best of the winter season as it was enjoyed throughout the 18th, 19th and early 20th centuries. Visitors can enjoy period demonstrations, living history vignettes, hands-on crafts, refreshments, tours, music, holiday decorations and historic settings by candlelight as night falls. The Museums by Candlelight program offers visitors the chance to explore sites by region and to visit as many or few locations as they want on this self-guided tour. “At a time when the economy is still in recovery, this event offers wholesome family recreation and entertainment as a gift to the entire community,” explains program and Historic Sites Consortium coordinator Elizabeth Scott Shatto. “A family of two adults and two children could easily realize a value of $80 by visiting four participating locations,” she added. South Mountain Heritage Society, where displays relating to the history of the Burkittsville area will include information on the 1862 use of the building as a hospital for soldiers wounded in the Battle of Crampton’s Gap. The Visitation Academy, where visitors will learn about the Academy being used as General Hospital #5 during the Civil War in September 1862 after receiving the first casualties from the Battle of Antietam. National Museum of Civil War Medicine, where participants will meet with soldiers, citizens and Santa Clause as they appeared during the 1860’s. At the Hessian Barracks, learn about the this site’s history as the only remaining structure from US Army General Hospital #1 which served during the Civil War (1861-1865). Barbara Fritchie House and Museum has informally participated in previous years, but is fully participating in this program as a member of the Frederick Historic Sites Consortium in 2012. Thomas House at Monocacy National Battlefield, a stately 18th-century brick manor house, is not typically open to the public, but is participating in Museums by Candlelight this year. The building was likely constructed by a Scottish merchant named James Marshall and was occupied by Christian Keefer Thomas during the Battle of Monocacy. Although it has been significantly altered over the past two centuries, it is in remarkably good condition and features a number of important 18th- and 19th-century architectural details. The recently restored structure now houses administrative offices for the battlefield staff. Catoctin Furnace Historical Society will be open and visitors may see the ca. 1810 Collier&apos;s Log House in the Village of Catoctin Furnace. The double log house, which is the linchpin of the largely intact colonial industrial village, was restored during the bicentennial era. The program here will focus on the early industry, lifeways and foodways of Catoctin Furnace, and northern Frederick County in an early nineteenth century atmosphere. All programs begin at noon. Unless otherwise noted in the detailed listings online, the City of Frederick sites will remain open until 7 p.m., while most other sites will conclude programs at 5 p.m. Please be sure to check the website for program details for each site, a printer friendly schematic map showing event locations, and a printer friendly program guide at http://www.visitfrederick.org/members/members/index/mcl. Rack cards are available at the Frederick Visitor Center (151 S. East Street, Frederick, Maryland), local visitor centers, welcome centers, and participating locations. The event is presented by The Frederick Historic Sites Consortium with support from the Tourism Council of Frederick County and Plamondon Hospitality Partners. For more information about other things to see and do in Frederick County and a complete listing of events, visit www.fredericktourism.org. 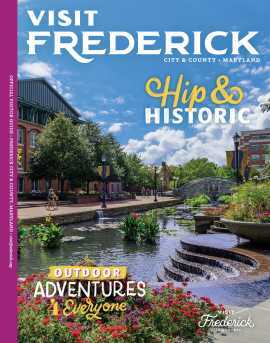 The seasonal Calendar of Events for Frederick County is available at the Frederick Visitor Center or online at http://www.visitfrederick.org/events. The October-March printed calendar captures the highlights of the hundreds of events that occur in the area each year. Featured events include holiday festivities, open houses, festivals, performances, and ongoing events.